The American Dental Association and the dentists at Newman Family Dentistry recommend that everyone come in for a dental checkup every six months. You may wonder: "Does this apply me?" The answer is, "Only if you have teeth that you wish to keep." "But what if the dentist didn't find signs of cavities at my last checkup?" - "It still applies"
"What about small children who just have a few teeth?" - "Yes"
"But I brush and floss regularly and avoid sugary foods. Do I need a dental exam every six months?" - The answer is still "Yes!" What is a dental checkup and why is it so important that everyone come in for one twice a year? A checkup includes a careful exam of each tooth and the gums surrounding it. We may also take an x-ray. Then we'll thoroughly clean each tooth and might even apply a fluoride treatment. Dental checkups generally don't include any needles or drilling. They are preventive dentistry measures to help you avoid needing more difficult work in the future. There are many reasons a regular checkup is a great idea. Even with the best oral hygiene habits, cavities can still develop. Catching a cavity when it's small and not well developed makes treatment fast and easy. Advanced cavities require much more difficult and unpleasant techniques. Having a dentist examine you every six months, including keeping a current x-ray of your jaw, prevents any cavity that develops from getting too far. Even with regular brushing and flossing you can experience gum recession. This can be the result of gum disease, overly aggressive brushing, or another illness. Any gum recession is a problem, since it can eventually lead to tooth loss and gum disease. With a regular dental exam, the dentist can help prevent recession from advancing to a dangerous point. Even with regular brushing and flossing, plaque still builds up on the teeth, especially in hard to reach places in the back of your mouth and below the gum line. The teeth cleaning we give you at your dental checkup removes all the plaque you may have missed and also removes tartar, a hard, mineralized substance that brushing can't. As hard as we all might try, most of us aren't as good at taking care of our teeth as we'd like to be. Visiting Newman Family Dentistry twice a year allows us to discuss your health habits, make sure you are using the best methods on the best schedule, and help you stay motivated to keep your mouth as healthy as possible. Studies have shown that patients who make regular trips to the dentist have the best dental hygiene practices. 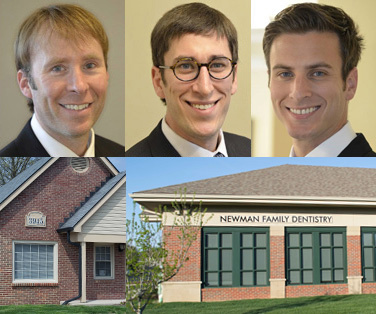 At Newman Family Dentistry, we want to help you keep your teeth and gums healthy and to prevent painful conditions and treatments down the road. That's why it's our goal to make it as easy as possible for you and your children to come in for regular dental exams every six months. We offer early morning and evening hours and why we have two locations in Carmel and Indianapolis. We work hard to make dental visits pleasant for patients of all ages. Contact Newman Family Dentistry today to schedule your next dental checkup and let us help you keep your smile healthy and beautiful for years to come.